A year and one day ago, Scotland’s Young Fathers released the music video for their song Low to little fanfare. 366 days later, we’ve seen this odd music outfit go from tiny steps to big treads. 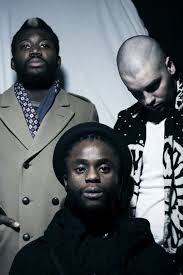 Their album Dead is nominated for the prestigious Mercury Prize and the power trio has acquired the novel description of being Britain’s first "Liberian/Nigerian/Scottish psychedelic hip-hop electro boy band". This is where the uncommon oddness of Young Fathers is further accentuated. Drawing heavily on the African heritage of members Alloysious Massaquoi and Kayus Bankole ('G' Hastings is the third non-African contributor), Young Fathers mesh the urban realism of their surroundings in Edinburgh with the faraway vibes of Soweto's Shangaan electro dance scene. It’s mad but somehow it works fantastically well. This is highly original British hip-hop, with smatterings of fuzzy shoegaze reverb and mainstream pop hooks thrown in for maximum rhythmic effect.